I find discovery of new knowledge incredibly exciting – to me, researchers are the great explorers of the modern era. However I also want to make a difference, to improve the lot of my fellow humans. The choice of stroke was in part for the excitement of a fast changing field but also driven by the recognition that stroke is probably the most neglected of the major diseases – tens of millions of people are disabled or die from stroke each year. I expect to contribute to better treatment for stroke patients, in particular to reduce the number of people with significant disability after stroke. Our group is already achieving this locally but have high expectations that we can make a significant contribution to better treatment worldwide. I also hope that our exciting discoveries regarding pressure changes within the skull after stroke will improve understanding and treatment of similar pressure changes after brain injury and other disorders. Professor Neil Spratt is a clinical neurologist and basic scientist who leads both a laboratory-based and a clinical research team, aiming to improve treatment and outcomes for stroke patients. 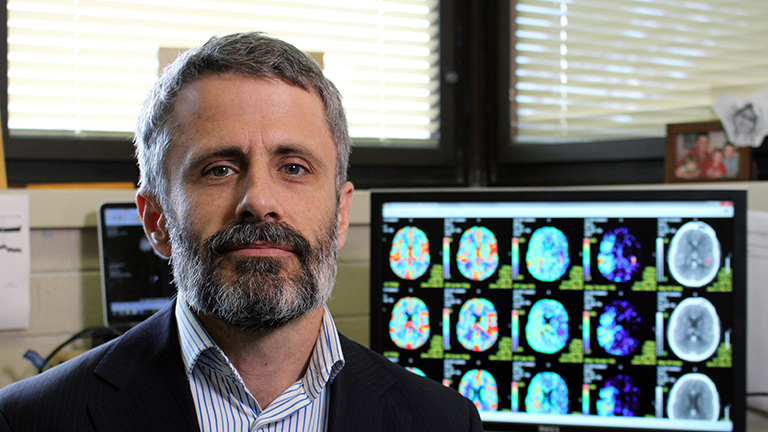 He is co-director of the University of Newcastle’s Priority Research Centre for Stroke and Brain Injury, which includes researchers based at John Hunter Hospital, HMRI and the University. Professor Spratt completed his medical degree with honours at the University of Newcastle, Neurology training in Newcastle and Melbourne and his PhD at the National Stroke Research Institute (Melbourne University). He is a staff specialist Neurologist at John Hunter Hospital, and is also taking a leading role in the development of the new medical degree being developed by the Universities of Newcastle and New England. The strong ethos of the stroke research group is to improve the lives of the 60,000 Australians affected by stroke each year. From improving the triage protocol in ambulances to ensure that patients get the right care as soon as they arrive at hospital through to optimising the CT imaging procedure of the brain to in turn determine suitability for a revolutionary clot-busting drug being tested by Hunter researchers, Professor Spratt and his team are dramatically improving the care of stroke patients in the Hunter. One such important achievement is his team’s discovery of a previously unsuspected rise in pressure around 24 hours after the onset of stroke symptoms. Professor Spratt and his team believe that this pressure rise is the likely cause of the in-hospital deterioration that occurs in around 15% of stroke patients, rendering many severely disabled. They have discovered that a brief period of body cooling (hypothermia) completely prevents this pressure rise. This method holds great promise as it is easily administered and is relatively inexpensive, making it more readily available to a wide variety of communities and locations. His stroke recovery research team have been pioneers of environmental enrichment for stroke recovery, and are currently conducting a multicentre clinical trial of this therapy. Professor Spratt has been an invited speaker at a multiple national and international scientific conferences, and is invited to review scientific papers and research grants for a number of prestigious international granting bodies, highlighting his high standing within the research community. Over the years, he has successfully gained more than $6 million in research funding to investigate the mechanisms and treatment options for stroke and has supervised multiple PhD students to completion of their degrees and future employment. Environmental enrichment and improving cardiovascular fitness post-stroke.